Summer may be winding down, but you can "set up tent" even into the cooler months. Summer may be winding down, but you can "set up tent" even into the cooler months. Basecamp Hotel in South Lake Tahoe has expanded (but kept its "adventurous" aesthetic). THE LAST TIME... you stow your sturdy, bug-attracting lantern or favorite hiking socks or beloved tent or sleeping bag for the season can elicit a deep and melancholy sigh. You might stop to stroke the tent a bit while you recall warm July nights up on some far-off granite ridge, watching the sun dip behind the horizon well after 9 o'clock. Those warm July nights and late sunsets, though, have a rather predictable way of concluding come the fall, and those travelers desiring the camp vibe have to wait for the warmth of springtime. 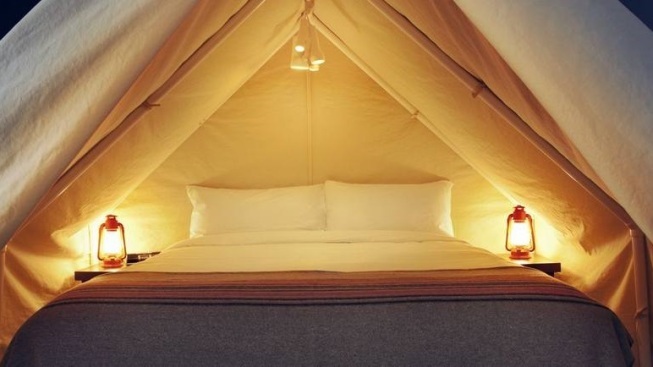 There is, of course, "indoor" camping, at least style-wise, at least at the Basecamp Hotel in South Lake Tahoe. If you think you'll be under a nylon covering, in rain, snow, or fine weather, you'll actually have a roof, as this very much a hotel. But the look inside is woodsy, rustic, and a touch retro, with actual tent-style coverings appearing in some of the rooms. Don't fear that you'll be *too* cut off from the alfresco pursuits, though, by staying indoors; Lake Tahoe is but a five-minute stroll away. If this tempts you, for the wintertime, the idea of camping but with a key to a door and a bathroom to boot, then take heart, camp-loving cozy-seekers: Basecamp just expanded. 24 NEW GUEST ROOMS: The hotel acquired the property next door, The Capri, and added two dozen new stay-over spots, all with that "adventurous design aesthetic" that Basecamp has become known for. There are new meeting spaces and a Beer Garden, too. It's open every Thursday through Sunday, and vittles beyond the beer shall be served, so come to eat, too. (Brats are on the menu, as are classic burgers and salads.) And if you like the idea of a cold brew and you want to get some biking in, there's a Bikes & Brews package pedaling into early fall. CALL IT CAMPING... with a touch of camp, if you will. You'll see tree motifs and other hallmarks of the forest, but all in an old-style, reclaimed motel-y setting. Basecamp Hotels is seeking to take existing structures and fill them with a bit of fable and fun, and the woodsy whimsy found at the now-bigger South Lake Tahoe property is a real-world example of this goal in action.